Stasis theory can help writers build information for all types of communication, and it can help writers conduct careful inquiry for exploratory and empirical research. Stasis theory is good for conducting research, because it acts as a series of analytical questions that helps writers collect information about the problem, issue, or topic under investigation. When answering the stasis questions, writers should try to gather information from a number of different credible resources, both primary (interviews, etc.) and secondary (literature review, etc. ), to triangulate their data. For more information on conducting research, see the OWL's research page. 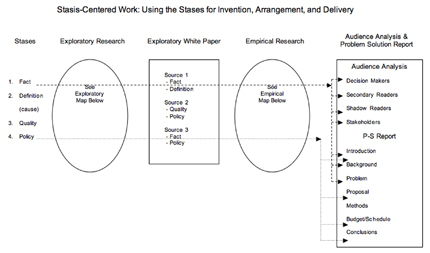 The graphic below illustrates how information built using the stasis questions is used in an exploratory white paper, an audience analysis and problem solution report. These documents might be assigned in a composition or professional writing course, or you might have to conduct research for these types of communications in the workplace. The stasis questions can also be integrated into maps that illustrate exploratory and empirical research methods. 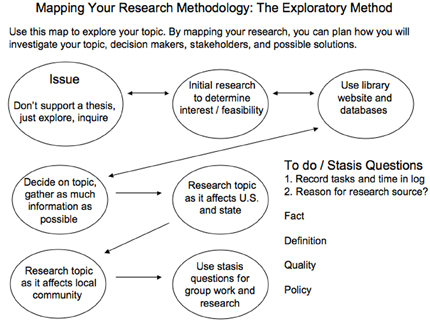 The map below illustrates how the stases can be used to help explore an issue before writers form a thesis or argument. 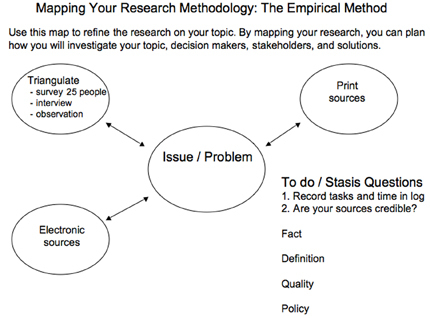 The stasis questions can also help guide empirical research and argumentative work associated with problem-solution papers and reports, as illustrated in the map below. Lastly, the stasis questions can help identify important gaps in knowledge. If you cannot answer some of the stasis questions effectively, you have identified a gap in knowledge that might need to be filled by conducting more research.